Click the image above to download a flyer about the events. 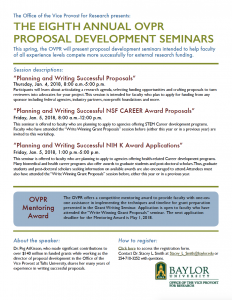 Registration is now open for the OVPR’s annual proposal development seminars! This year, we will offer the all-day “Planning and Writing Successful Proposals” program on Thursday, Jan. 4, 2018, as well as two two special half-day sessions focused on federal career development grants. The first half-day session, on the morning of Friday, Jan. 5, is focused on STEM awards like the National Science Foundation’s Faculty Early Career Development (CAREER) Program. The second, on the afternoon of Jan. 5, covers biomedical career development programs like the National Institutes of Health’s Career Development Awards, including the mentored K-awards and the F-series fellowships for pre- and postdoctoral students. Special eligibility requirements apply to the half-day sessions; see the program descriptions below for specific information. Our speaker for each of the sessions is Dr. Peg AtKisson, a neuroscientist and former director of proposal development in the Office of the Vice Provost at Tufts University. Click here to register for the seminars. Contact Dr. Stacey L. Smith at 254-710-3252 with questions. 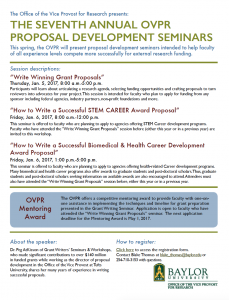 This year, we will offer the all-day “Write Winning Grant Proposals” program on Thursday, Jan. 5, 2017, as well as two two special half-day sessions focused on federal career development grants. The first half-day session, on the morning of Friday, Jan. 6, is focused on STEM awards like the National Science Foundation’s Faculty Early Career Development (CAREER) Program. The second, on the afternoon of Jan. 6, covers biomedical career development programs like the National Institutes of Health’s Career Development Awards, including the mentored K-awards and the F-series fellowships for pre- and postdoctoral students. Special eligibility requirements apply to the half-day sessions; see the program descriptions below for specific information. Our speaker for each of the sessions is Dr. Peg AtKisson of Grant Writers’ Seminars and Workshops. Dr. AtKisson is a neuroscientist and former director of proposal development in the Office of the Vice Provost at Tufts University. Click here to register for the seminars. Contact Blake Thomas at 254-710-3153 with questions. The National Institutes of Health will present the final regional seminar of the year next month in San Diego. Dozens of NIH officials will be on hand to share information and strategies on every aspect of sponsored biomedical research. For those new to NIH research, a newly redesigned new investigator track will provide step-by-step guidance for career advancement. There will also be opportunities for one-on-one meetings with program officers as well as the chance to network with colleagues from around the country. Regular registration rates apply until Sept. 14, so make plans to attend soon. More information and registration information is available on the NIH Office of Extramural Research website. Part of the “E-BEARS” series presented by Baylor’s School of Engineering and Computer Science. 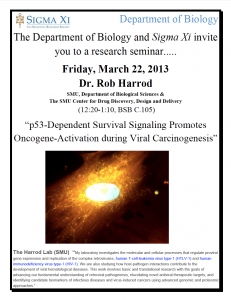 Baylor’s Department of Biology and Sigma Xi present a research seminar with Dr. Rob Harrod. 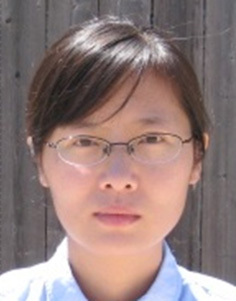 Harrod is an assistant professor in SMU’s Department of Biological Sciences and the SMU Center for Drug Discovery, Design and Delivery. His laboratory investigates the origin, development and effects of viruses which cause blood diseases like leukemia and HIV. The goal of his research is to develop therapeutic targets and identify biomarkers of infectious diseases and virus-induced cancers.